Fancy a spell-binding D.I.Y project? Then take inspiration from this magic-loving dad! 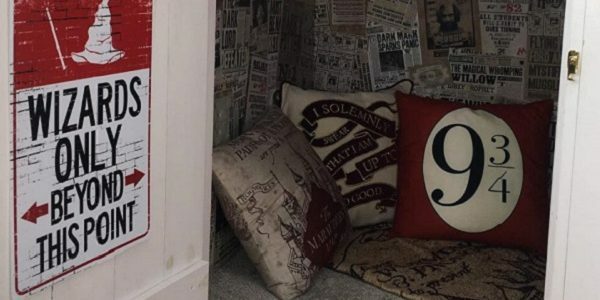 Dad-of-two, Peter Fragola definitely must have some wizarding blood in his veins, because this recreation of of Harry's famous room under the stairs has to be seen to be believed. "As an elementary school principal and former teacher, I know how important it is for children to have a space of their own to read, a space where they feel comfortable and is free from distractions from today's electronics, TVs and iPads." " I knew the first time I saw this space 'under the stairs' that I could transform it into something (pardon the pun) MAGICAL." If we could hop on the Hogwarts express to the Fragola house we definitely would! So long Muggles we're off under the stairs!